What is speaking in tongues and why does God say in 1 Corinthians 14:5 that He would like each Christian to do it? No doubt that is a question that has been asked by millions of Christians through the centuries and knowing the answer is vital if a believer is going to maximize the quality of his life as a follower of the Lord Jesus Christ. Speaking in tongues is a Christian speaking a language that he does not understand, a language that has been given to him by the Lord Jesus Christ via the gift of holy spirit. Why should every Christian speak in tongues? A primary reason is that speaking in tongues is the only absolute proof a Christian has that he is born again and guaranteed everlasting life in Paradise. Second, speaking in tongues illustrates to the believer the most basic principle of the Christian walk, which is trusting the Word of our heavenly Father. Third, speaking in tongues allows each Christian to be a “witness” to the resurrection of Jesus Christ. Furthermore, when we speak in tongues in a fellowship of believers, we are able to obey God’s exhortation in 1 Corinthians 14:12 (KJV): “seek that ye may excel to the edifying of the church” by then giving the interpretation of what we have just spoken. In this article we will expand upon these primary reasons why God wants every Christian to speak in tongues, as well as give even more benefits for using this God-given supernatural ability. However, before we expound on what speaking in tongues is, it is helpful to understand what it is not. 1. It is not a gift. No properly translated verse of Scripture calls speaking in tongues a gift. It is a manifestation of holy spirit. 2. It is not gibberish, babble, or a made-up language, even though the tongues that some people speak seem very strange to our ears. For one who speaks in a tongue does not speak to men, but to God; for no one understands, but in his spirit he speaks mysteries. The NASB has the phrase, “for no one understands,” which is an accurate translation of the Greek text. Many versions add the word “him” at the end of the phrase, saying something such as, “for no one understands him.” This creates an error that contradicts other verses of Scripture (Acts 2:11). It also contradicts the experience of many Christians because it has been reported many times that someone in a congregation understood what another person spoke in tongues. When it comes to speaking in tongues, “no one understands,” that is, no one speaking will understand what he himself is saying. 4. It is not designed for missionary work. The language is given by the Lord via the holy spirit, not chosen by the speaker. There are a number of reasons given in the Word of God for a Christian to speak in tongues and missionary work is not among them. Nor is there any record where anyone used speaking in tongues to do missionary work. This idea came about as a result of what happened in the early Pentecostal movement when God, apparently to show people that speaking in tongues was not gibberish, gave known languages to people as they spoke in tongues just as on the Day of Pentecost when the audience understood the tongues the Apostles were speaking. For example, when Agnes Ozman manifested speaking in tongues, she spoke in Chinese. Upon hearing these foreign languages, people assumed they were for mission work. 5. It is not “dead,” “gone,” or “passed away.” Some Christians believe that speaking in tongues was only for the early Church and is now gone, but that cannot be the case. Tongues edifies the speaker, is prayer in the spirit, is giving thanks well to God, and more. Surely these things are as necessary in the Church today as they were in the first century, and surely it is as important to be confident of our salvation today as it was 2000 years ago. 1 Corinthians 13:10–12 says that speaking in tongues will pass away when “that which is perfect is come,” and when we know “even as we are known.” “That which is perfect” is the Lord Jesus Christ, as verse 12 makes clear when it says we will be “face to face” with him, and we will know as we are known only when the Lord comes. Until then we will continue to know “in part” (1 Cor. 13:12) and only “…see through a glass, darkly…” (1 Cor. 13:12 – KJV). Until that time, speaking in tongues will continue to be a blessing to the Church, which is why God tells us not to forbid it (1 Cor. 14:39). Speaking in tongues is unique to the Church Administration, and when the Lord “raptures” us to meet him in the air, speaking in tongues will cease because it will no longer be necessary. Many people have mistakenly allowed the second part of this verse to obscure the first part, but the first clause is very clear. The truth is that God wants us to speak in tongues, interpret, and prophesy, but you cannot do all three unless you do each one, and each is very important for the growth of the Church. Some versions, such as the NASB, have “wish,” as if God “wishes” that we spoke in tongues, but that is not a good translation in this context. God gave the gift of holy spirit; Jesus said that those who received it would have power, and the manifestations of the spirit are for “each” believer (1 Cor. 12:7). God wants (ESV, RSV) or “would like” (NIV), or “desires” (Darby) for us to speak in tongues and we will see why. 2. It is the absolute proof to a Christian that he is saved, born again, and guaranteed everlasting life in Paradise. Speaking in tongues is a manifestation of holy spirit (1 Cor. 12:7–10) so the only people who can speak in tongues are those who have holy spirit, and every Christian was sealed with holy spirit when he believed (Eph. 1:13). 1 John 3:24b says: “…this is how we know that he lives in us: We know it by the Spirit [spirit] he gave us.” The primary way that we “know” from the spirit that Christ is in us is speaking in tongues. For various reasons, none of the other manifestations are absolute proof. This is such an important point that we will expand it in the next section. 3. It vividly illustrates the most basic principle of the Christian walk, which is trusting and obeying the Word of our heavenly Father. And, as we will see, speaking in tongues is the only way to really make Jesus “Lord.” We will expand this point in the next section. 4. It is a witness of the resurrection of Christ to the believer, and also a sign to unbelievers (1 Cor. 14:22). Throughout history, the Jews asked for signs. Moses turned his stick into a snake as a sign, Joshua set up rocks as a sign, Gideon wanted a sign from the angel that spoke to him, and the Jews were constantly asking Jesus for signs. Now God has given us a sign of His work and the presence of His holy spirit within us, and it is an open and bold witness of the resurrection of Jesus Christ. We will expand this point in the next section. 5. It is speaking a language of men or of angels (1 Cor. 13:1), a language that is not understood by the one speaking in tongues. Speaking in tongues can be a language of angels, which explains why there are so many tongues that are not known human languages. The one speaking in tongues does not understand what he is saying (1 Cor. 14:2 – NASB). 6. It is speaking to God, not to men (and thus a true interpretation is also to God and not to men). (1 Cor. 14:2). 8. It is speaking the wonders of God (Acts 2:11). On the Day of Pentecost, the phenomenon was that the audience could understand what the Apostles were speaking in tongues, something that generally does not occur (1 Cor. 14:2). Even the skeptics in the audience, however, had to admit that the Apostles were speaking the wonders of God. 9. It is praise to God (Acts 10:46; 1 Cor. 14:16 and 17). 10. It is edifying to the one speaking (1 Cor. 14:4; Jude 20). 11. It is giving thanks well to our Heavenly Father (1 Cor. 14:17). 12. It is prayer in the spirit (1 Cor. 14:14 and 15). Often, fervent and emotional prayer by Christians in charismatic circles is called “prayer in the spirit,” but in the Bible that phrase refers only to speaking in tongues. 13. It is under the speaker’s control and thus can be misused and operated incorrectly, which is why the Word gives almost a whole chapter (1 Cor. 14) on how to do it properly. 14. When sung instead of spoken, it is a “singing in the spirit” (1 Cor. 14:15; a person can speak or sing in tongues). The only “singing in the spirit” in Scripture is singing in tongues. 15. 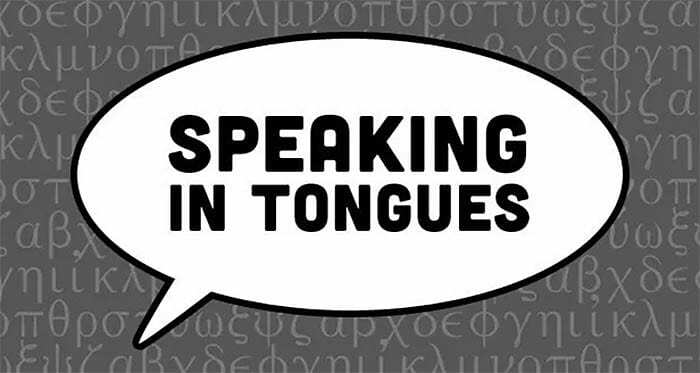 Speaking in tongues is to speak a language that does not come from your mind, but by way of God’s spirit within you. It is primarily designed for one’s personal edification and use, but it is also to be utilized in a gathering of Christians by following it with its companion manifestation, the interpretation of tongues so that the Church is edified by one’s praise to God. Speaking in tongues followed by the interpretation of tongues enables each believer to obey God’s exhortation to “…strive to excel in building up the church” (1 Cor. 14:12b – ESV). What an awesome privilege to be able to build up the Royal Family of God, but one cannot build up the Church by the manifestation of interpretation of tongues unless he first speaks in tongues. Speaking in tongues is the only absolute proof a Christian has that he is born again and guaranteed everlasting life in Paradise. Speaking in tongues is supernatural, i.e., it is beyond man’s natural ability. It is a God-given ability made possible by the presence of holy spirit that is born inside each Christian. No non-Christian can speak in tongues. When a person gets saved, born again, he is sealed with the gift of holy spirit (Eph. 1:13). Speaking in tongues is God’s witness to us that we are indeed born again of incorruptible seed (1 Pet. 1:23 – KJV). Remember that speaking in tongues and its companion manifestation, interpretation of tongues, were conspicuously absent prior to the Day of Pentecost. The question is: What is so unique about speaking in tongues that God reserved it just for us who are born again of His spirit? It is not what is unique about speaking in tongues; it is what is unique about salvation in the Church Administration that necessitated speaking in tongues as the indisputable proof of that unconditional salvation. In no other administration was salvation equated with seed, birth, and therefore permanent sonship. In neither the Old Testament nor the period of the Gospels was salvation permanent, and no one ever dreamed it would be. Talk about “the world’s biggest deal.” This is it! God came up with proof that to the ignorant may seem absurd, but which is actually very ingenious and practical. 2 Corinthians 1:22 says that God “set his seal of ownership on us, and put his Spirit [spirit] in our hearts as a deposit, guaranteeing what is to come.” The Greek word translated into English as the phrase “deposit, guaranteeing what is to come” is arrabon and it means a token, a down payment, a guarantee. In the KJV it is translated “earnest,” as in “earnest money” that is put down on the purchase of a house. The manifestation of the holy spirit known as speaking in tongues, which only Christians can do, gives the believer positive proof that he is saved. Speaking in tongues is the most powerful and convincing way in which our holy spirit testifies that we are children of God. “Tongues” is a language that God gives you, just as He first did on Pentecost when the Church was born. And the record in Acts 2:1–4, where the Apostles spoke in tongues immediately after they were born again and received holy spirit, is the pattern God intended for every Christian, which is that each one speak in tongues right after he is born again. Why? For many reasons, among them, so that each Christian immediately knows once and for all that (a) he has everlasting life, (b) the Word of God is true, (c) Jesus Christ is alive, (d) he is filled with the power of God and can utilize all the other manifestations, and also (e) that he can immediately begin to praise and pray to God in the spirit. That is why God clearly says in 1 Corinthians 14:5 that He would like each Christian to speak in tongues. We think that for our Father, hearing a newborn Christian speak in tongues parallels how a mother feels when she hears her newborn baby make its first cry—it’s alive! The difference is that when God hears a child of His speak in tongues, He knows the person will live forever. How tragic that countless Christians never take advantage of this marvelous ability. They do not because they cannot—cannot, that is, if they are taught that speaking in tongues ended with the first-century Apostles, or that it is devilish, or that it is a gift for only some people, or if they are taught nothing at all about it. In the past 35 years, we have had the awesome privilege of helping to lead thousands of dear saints into speaking in tongues, some of whom were 60–80 years old and had desired to for decades. With a few minutes of instruction, they easily did it and many cried tears of great joy. We said earlier that speaking in tongues is very practical. How so? The second vital truth about speaking in tongues, and also why God wants every Christian to start doing it immediately, is because it perfectly illustrates the “bottom line” principle of the Christian walk, which is trusting God and His Word. Trusting God is how we find out whether or not He keeps His Word. Does that require any faith, any trust in God and His Word? It sure does, and that is what being a Christian is all about. It always comes down to whether or not we really believe what God says. Do you want to see a biblical record that vividly illustrates exactly the same principle involved in speaking in tongues? Look at Matthew 14:25–33. The disciples are in a boat trying to cross the Sea of Galilee in the middle of a storm. Jesus strolls by—on the water. They freak out. Now put yourself in Peter’s potentially soggy shoes. Does he have a promise? Yes. What is it? That he can walk on the water—Jesus would not ask him (or you) to do anything he could not do. And with the promise comes a provision—”If you step out, I’ll help you.” Now it’s Peter’s turn. How will he find out if the promise is true? There’s only one way—step out of the boat! And he did! But it was not until the split second his foot touched the water that God “took His turn” and made it firm under his feet. Had Peter put his foot one inch from the water and said, “Oh, this won’t work,” he never would have experienced the power of God. See the principle? We have to act on the promise if we want to see the power of God. It is exactly the same in regard to speaking in tongues. If you are born again, you can speak in tongues. How do you know? Because God would not ask you to do something you cannot do. He clearly says, “I would like every one of you to speak in tongues…” (1 Cor. 14:5a). Furthermore, as we have set forth, He gives you plenty of incentive and motivation by setting forth its benefits. So whose turn is it now? Right—yours. What do you have to lose to give it a try? You just open your mouth and utilize the mechanics of speech, but do not speak English or any other language you know. What you will be speaking is whatever language God chooses to give you. If it is a language of men, someone somewhere on the earth (among the approximately 6000 or so dialects) could understand it. If it is a language of angels, no one on earth would understand it. NOW HEAR THIS! When it comes to speaking in tongues, there is only one way to fail—and that is not to speak. Please get this: if you open your mouth and speak (not a language you know), it cannot fail—you will speak in tongues. Now then, if you do move your lips, your throat, your tongue and formulate different words and you fail to speak in tongues, do not call us—call The Guinness Book of Records because you will be the first human being since the Day of Pentecost for whom it did not work. Why? Because it is impossible for God to lie and He was the one who asked you to speak in tongues. If it does work, we would love to hear from you. If you are having trouble and you genuinely want to speak in tongues, please contact us and we will be glad to help. Just as the water did not become firm until Peter’s foot actually touched it, so God does not give you the words until you speak. Do you see how this perfectly illustrates what the Christian life is all about? God makes many promises to us, but the only way they come to pass is when we act on them. Our heavenly Father makes wonderful promises to us because He adores us, and oh, how He longs to fulfill them to us for our benefit. Therefore I tell you that no one who is speaking by the Spirit [spirit] of God says, “Jesus be cursed,” and no one can say, “Jesus is Lord,” except by the Holy Spirit [no article “the.” Read “holy spirit”]. If we refuse to do so, we are, in essence, making ourselves lord in that area of our lives. As Jesus said, “Why do you call me, ‘Lord, Lord,’ and do not do what I say?” (Luke 6:46). No wonder 1 Corinthians 12:3b says, “…no one can say, ‘Jesus is Lord,’ except by the Holy Spirit [holy spirit].” The word “can” is dunamai in the Greek text, which is “to be powerful, to be able.” Thus, The New Living Translation says that no one “is able to say” that Jesus is Lord except by holy spirit. The Amplified Bible reads: “no one can really say” that Jesus is Lord except by holy spirit and we think that captures the essence of what God is saying here. If we are not willing to do what God has told us He wants us to do, then we are not able to really say that Jesus is Lord of our lives. Speaking in tongues allows each Christian to be a “witness” to the resurrection of Jesus Christ. A person cannot speak in tongues without the presence of holy spirit inside him and so speaking in tongues is a “sign” to each Christian that he has the spirit of God. It is also a sign to unbelievers (1 Cor. 14:22). In a court of law, “hearsay” is not admissible as evidence. Only a firsthand seeing or hearing will stand up under cross-examination. But we today do not have the luxury of being with Jesus Christ as his disciples did, nor were we there when they crucified our Lord, nor when he arose from the dead, nor when he appeared to his disciples. How then can we be expected to be enthusiastic “witnesses” for him? Is there any comparable sensory connection we can have with our Lord? (16) The Spirit itself beareth witness with our spirit, that we are the children of God. It is safe to say that the power with which the Apostles witnessed to the resurrection included speaking in tongues themselves and helping others to do likewise. In the next chapter of Acts, after the Apostles had been miraculously freed from prison and gone right back to the Temple courts to preach the Word, they were taken before the Sanhedrin. The high priest chastised them for speaking the Word after the council had forbidden them to do so. Watch what Peter says and note verse 32 especially. When the Apostles said that the holy spirit God had given to those who obey Him was a witness that Jesus was raised from the dead, it is obvious that the clearest witness, which God even calls a sign for unbelievers, is speaking in tongues. The more real the witness of the holy spirit within us, the more real is our witness to others. The next section we will consider has three uses of the word “spirit” and nine uses of the word “witness” in five verses. Verse 6 is saying that Jesus Christ was born into the world as a true human being, coming by way of “water and blood” like every other human. Verse 7 says that the spirit of God witnesses to the reality of Jesus’ life and verse 8 is saying the same thing that Romans 8:16 says—the spirit of God bears witness in each Christian. Verse 9 says that the witness of God is that Jesus is who God says he is. Then, verse 10 says that whoever believes in Jesus has the “witness” within himself and verse 11 says that this inner witness is the testimony that we are saved. Verse 13 reiterates that the previous verses were written so that we who believe in Jesus Christ could know for sure that we have everlasting life. Just as “doubting Thomas” touched the nail print in Jesus’ hands, and just as the other disciples saw Jesus, heard him, and touched him, so we today have an experiential, “firsthand” sensory knowledge of his resurrection. We have that every time we manifest his holy spirit by speaking in tongues. It is our indisputable proof that HE IS RISEN! 1. Remember that you will not understand what you are saying. 2. You must do the speaking. Scripture says of the Apostles on the Day of Pentecost that they spoke in tongues and the testimony is the same in every reference to it. For example, 1 Corinthians 14:2 says, “…anyone who speaks in a tongue….” There is never a reference to “the Lord” speaking. It is the person who is doing the actual speaking. Some Christians do not speak in tongues even when they know it is God’s will and want to do so because they expect God to speak through them, i.e., take over their mouths and make them speak. He will not do it. The Bible says you do the speaking. 3. You must speak. Right now, say out loud: “I know that God wants me to speak in tongues,” and pay attention to what you are doing as you speak. You move your mouth, you move your tongue, and you make the sounds. Speaking in tongues is speaking. If you will not move your mouth and make the sounds, then you will not speak in tongues, or any other language for that matter. 4. The language forms syllable by syllable as you speak. Because no one understands what he or she is saying in tongues, you cannot wait until you know what you are going to say and then speak. The Lord will not give you a sentence in tongues ahead of time that you then speak forth. Rather, he will “put on your tongue” a syllable, which will come out as you speak. It is a walk by faith. You open your mouth to speak, and AS you speak the Lord provides the syllables. 5. Speaking in tongues will probably seem very strange at first, but just keep on doing it. Remember, in speaking in tongues, the words come from the gift of holy spirit inside you and not from your brain and this will be new to you. You are not used to just making sounds without understanding them, but that is what you have to do to speak in tongues. Practice makes it easier. 6. You may tend to repeat the same syllables or words over and over. Although that is speaking in tongues, it is not the developed language that you should desire. Remember that you are doing the speaking, so relax and let the Lord help you expand your vocabulary with different sounds. If you get stuck and find yourself saying the same word over and over, force yourself to try different vowel and consonant sounds so that you will get unstuck. 7. The Devil may try to tell you that you are just making up words. If so, make up these words for him: “Get lost.” The best defense is a good offence and the best offense is knowing and acting upon God’s Word. Scripture tells us that the Lord wants us to speak in tongues and makes it clear that we can. It tells us that we will not understand what we are saying. Furthermore, it is clear in Scripture that we are the ones who do the actual speaking. Because speaking in tongues is under your control, and you are doing the speaking, it may indeed seem like you are making up the language, but you are not. Remind yourself of all that and “…Resist the devil, and he will flee from you” (James 4:7). Then, “Humble yourselves…under God’s mighty hand…,” “…standing firm in the faith…” (1 Pet. 5:6 and 9), and boldly speak in tongues. So relax, take a deep breath, let it out slowly, and focus your mind on the God and the Lord who love you immeasurably. Thank them for having filled you with the holy spirit, take another breath, and go for it—speak forth words of praise, thanksgiving, and worship. And that is exactly what you will be speaking. And be BOLD—the words you are hearing are the proof that Jesus is alive and well—and you are too—forever! It cost him his life for you to be able to praise and worship God in this wonderful way, so get into it! One more thing—not only will you hear the words you are speaking, like when you speak in your native tongue, but because you are not using your mind to speak in tongues, you can also listen to what you are saying—and that is why it may sound really strange at first. But so would any language you have never heard before. The Lord is with you. Go for it! And know that as you are speaking in tongues, you are praising your wonderful heavenly Father and touching His heart with your love for Him. God bless you.